Langston Hughes once asked, “What happens to a dream deferred?” Does it follow you like a student loan, affecting your life for decades to come? For youth around the country, higher education has become increasingly unaffordable and garners the risk of getting stuck in one of the worst types of debt. Recent college students are defaulting on loans at the highest rate in two decades. This can lead to garnished wages, intercepted tax returns, being sued, and even having Social Security withheld later in life. 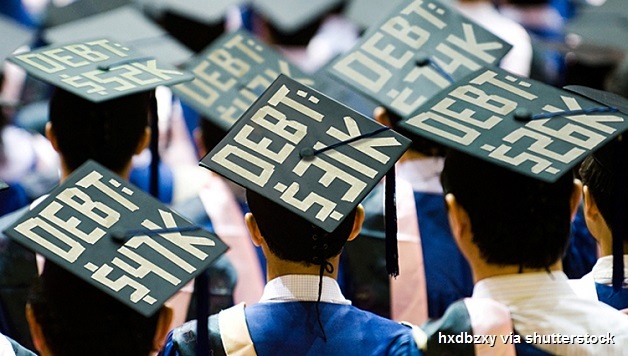 Nationwide, student debt has tripled over the past decade to a staggering $1.2 trillion. The class of 2014 is graduating as the “most indebted class ever,” and the trend shows no signs of decreasing. People of color and women are disproportionally affected by the student debt trap. Students of color have higher amounts of debt compared to their white counterparts, with African-American students having the highest differential, at 29.5%. And since women make only 59% of what men earn over their lifetimes, women have a harder time making loan payments and must devote a larger portion of their paychecks to student loans than men. Overall, this is the direct result of the massive neoliberal cuts to education implemented after the Great Recession that slashed the funding of higher education institutions by 23%. Public colleges responded by raising tuition rates which, combined with families’ falling incomes, caused students to take out larger and larger loans to cover the costs. Another driver of student debt is hundreds of for-profit schools that can be up to twice as expensive as state universities and six times as expensive as community colleges. Forprofit colleges also encourage their recruiters to increase enrollment by using fear tactics that prey on low-income youth. 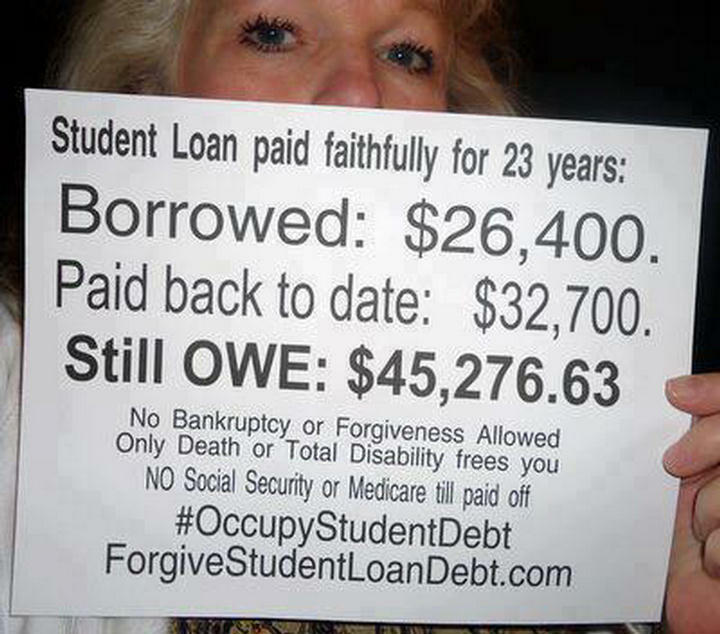 Under capitalism, corporations like Sallie Mae trap students in a vicious cycle of debt with huge interest rates. This is similar to when major banks created the sub-prime mortgage crisis, setting in motion capitalism’s worst recession since the Great Depression. 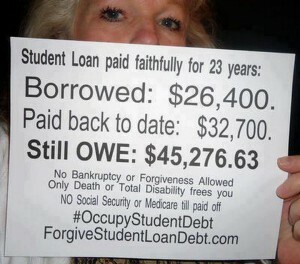 Afterward, the banks got bailed out and the homeowners had to deal with the consequences of foreclosures and evictions. College students are now stuck in a stalled economy, unable to find employment with an income high enough to pay back their loans in time, creating a student debt bubble reminiscent of the housing bubble in 2007. President Obama has worked to lower the interest rate on student loans and cap monthly loan payments at 10% of a student’s income. Democratic Senator Elizabeth Warren has proposed a bill that would allow students to refinance their loans at lower interest rates. Although these would be small steps in the right direction, they are not nearly enough to curb the exploitive nature of capitalism and the student debt trap. Socialist Alternative would take it much further, proposing to cancel all student debt. Education should be a human right. Our country should make higher education free, as they have done in some Nordic countries like Sweden, where not only is higher education free, but students are given a monthly grant to help with living expenses. Instead of offering youth a promising future, capitalism makes students carry the burden of its failures as a social system. 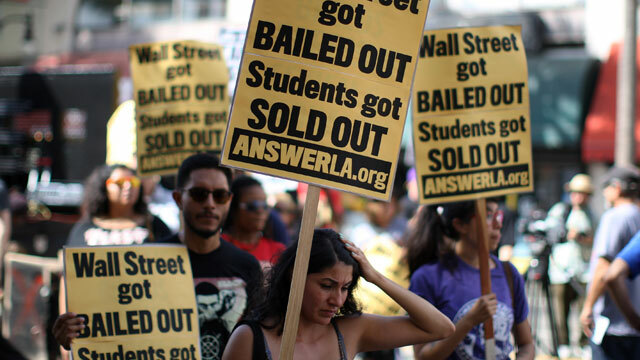 The fight to cancel student debt needs to be connected to the fight for the socialist transformation of society, where corporations are publicly owned and democratically controlled so economic decisions are based on human and environmental needs, not maximizing profits. What message do we want to send to future generations: that they should reach for their dreams, or struggle just to survive? Previous articleAll Out to Ferguson’s Coming “Weekend of Resistance” — Oct. 10-13!